With the arrival of Apple devices HomePod, Apple Watch, AirPods, Apple Music subscription number has been growing quickly. It offers two main different plans for its customers including individual subscription $9.99/month, family subscription $14.99 which supports up to 6 people. You can pick up the right plan during the subscribing process. But what if you pick up a wrong subscription after a while? Do you need to start over from scratch? Can you change it to the other plan easily? Will it charge you twice? Please just don't be concerned. 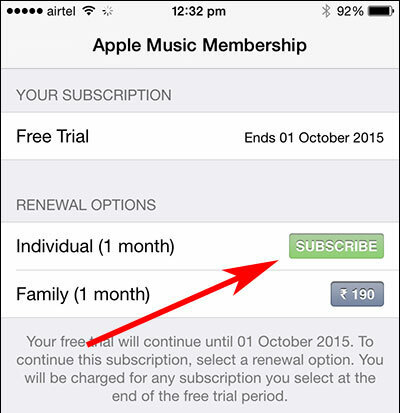 Apple allows you to switch between Apple Music individual and family plans for free. Yet, all your original playlists and songs are kept intact from your own library. If you find that your family members like your wife, children or any relatives also enjoy the same Apple Music like you do, you don't have to let them sign up repeatedly. Just upgrade to the Apple Music Family membership to save the total cost. To do that, you need to be the organizer of a Family Sharing group. You can do that on iOS 8 and OSX Yosemite or later versions. Here are the steps to set up it on iPhone. 1. Launch your iPhone and then click "Settings" to enter the preferences window. 2. 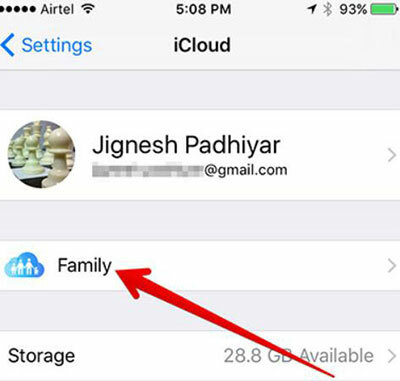 Click the menu "iCloud" > "Set Up Family Sharing" and follow the screen wizard to complete the create the Family Sharing group. 3. Now you should see a new menu "Family" under the "iCloud" tab, you can click it and then add members to the group. 1. Launch the Music app from your iPhone, iPad or iPod. 2. Go to the "For You" tab. 3. Click the profile icon and then input your account name and password to login. 4. Click "Manage" under "Subscriptions". 5. From there, you can click the "Subscribe" icon next to the Family plan. The Apple Music Family plan is not only good for family members but also friends. But if all your relatives or friends except you are not interested in Apple Music anymore, there is no reason to keep it. You can switch to Apple Music Individual within a few steps. When it is done, all the members from the family group won't have access to the account anymore. But their playlists, likes, preferences are still kept for a brief time in case they want to subscribe to it again later. 1. Open the Apple Music app from your iDevice. 2. Go to "For You" tab. 3. Click the account icon and login with your account and password. 4. Click "Manager" menu under the "Subscriptions" tab. 5. Click the "Subscribe"icon next to "Individual" to change to personal subscription. Within a Family Group, you can enjoy Apple Music at a much lower price in average. But if you just prefer individual membership of Apple Music, you can leave the Family and join the person plan by yourself. 1. Go to settings window of your iOS device. 3. 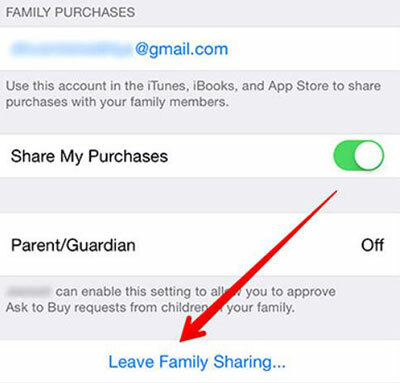 Click your name and click "Leave Family Sharing" menu. 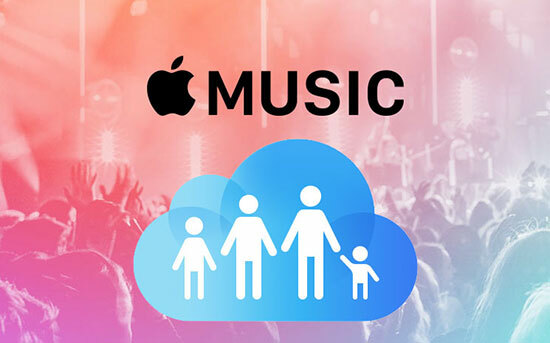 After leaving the Family Sharing group, your personal listening data will be stored on Apple Music server for a short time, you can start over to sign up Apple Music individual plan as you want and restore your library. If one of your family members have already subscribed to the family plan, then you don't need to waste money subscribing it again. Just ask the organizer of Family sharing to add you. And then follow the steps to join the Family. 1. Launch the Music app from your iDevice. 2. Tap on the account icon and enter your Apple ID & password if required. 3. Tap on "Manage" menu under "Subscriptions". 4. 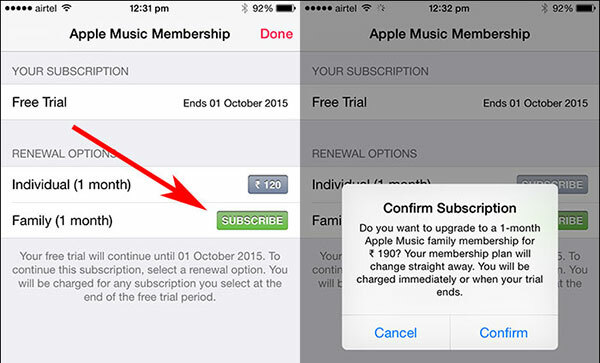 Select your "Apple Music Subscription and turn off "Automatic Renewal on Apple Music". 5. When your renewal period is expired, you can simply log out and log back again. You can continue to enjoy the music service under the Family group without spending extra money. No matter how you want to switch your Apple Music plan, you can do that within a few steps. Please just follow the right instruction based on your requirement. The best part of Apple Music is that it will store your personal playlists as well as other listening data so that you will have consistent experience after switching membership. By the way, if you'd like to take it further to backup your Apple Music songs, you can also use the third party DRmare Apple Music Converter for Mac/Windows to help you convert all the songs to MP3 for backup offline. How to Listen to Apple Music through Web How to Search by Lyrics in Apple Music App Apple Music Student Discount: How to Get!